Not sure which version of Intego software you are using on your Mac? Please click here. No matter how you launch NetUpdate, the program connects to Intego's server to determine whether you have the latest version of your Intego software installed. If a new version is available, you will be able to download and install it using NetUpdate. 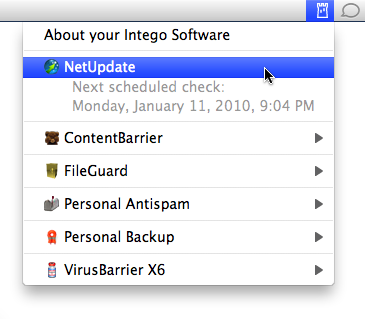 When NetUpdate connects to the Intego server, it displays a list of available updates. Applications whose names are not present are either not currently installed on your Mac or do not have any available updates. You will, however, always see products that require a subscription even if there is not an update available. This is so you can check how much time remains on your subscription. A dialog box displays asking you for your administrator's password; only users with administrator's privileges can download and install updates using NetUpdate. After you enter the correct password, NetUpdate will automatically download the selected update(s) to your computer, and will install it or them as soon as the download has completed. In some cases, you may need to restart your Mac after NetUpdate has finished installing updates. No matter how you launch NetUpdate, the program connects to Intego's server to determine whether you have the latest versions of the Intego programs, support files, and virus definitions or other filters installed on your computer. If new versions are available, you will be able to download and install them using NetUpdate. ¿Cómo renuevo mi software de Intego?